Tobias Druitt is a pseudonym for Diane Purkiss and Michael Dowling, Oxford-based mother and son. 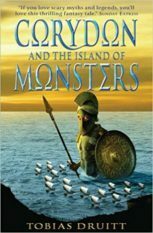 Their extraordinarily accomplished debut novel, Corydon and the Island of Monsters, is a retelling of the Greek myth of Medusa seen through the eyes of a young shepherd boy, Corydon, and is the first of a trilogy. Simon and Schuster publish in the UK and Knopf in the USA.